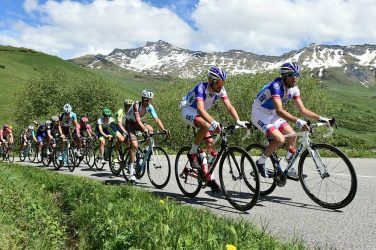 Watch the world’s very best professional bike racers in a beautiful part of France at the Critérium du Dauphiné, whilst you also experience for yourself premium quality fully guided bike rides with the local French Alps bike race tour specialists. 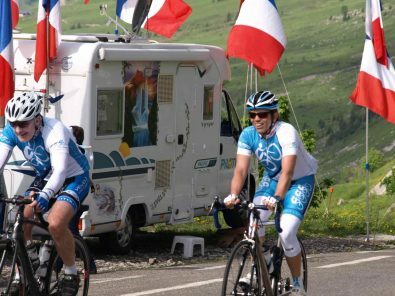 For all avid fans and discerning cyclists who may have seen the Tour de France in July, enjoy the biggest stars in cycling without the crowds, classic cycling and the majestic beauty of the French Alps at their best! The Critérium du Dauphiné is the final lead up race to the Tour de France each year, which means you can expect a spectacle of racing delights with the worlds very best climbers and general classification professionals testing their physical limits. This year the race route is ‘off the beaten track’ with new roads and new climbs a greater challenge for all the expected TDF riders. 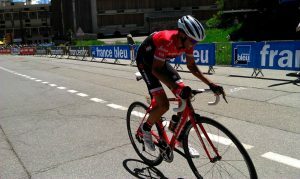 This premium bike tour brings you up close and personal with live viewing of the final Alpine stages of the 71st edition of the Critérium du Dauphiné bike race at our “unique viewing spots” only achievable from the experienced local Annecy bike tour team. 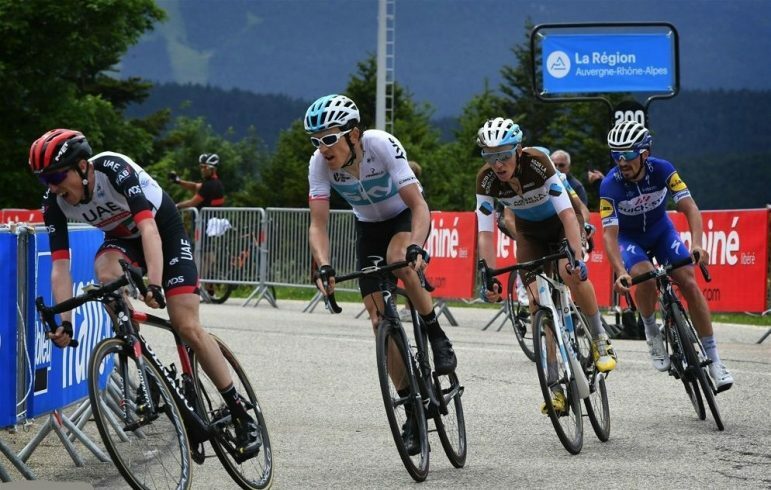 Enjoy the action of Geraint Thomas, Adam Yates, Romain Bardet, Warren Barguil and Dan Martin all targeting the Dauphine 2019. Each day will also include the very best bike rides in the world, fully guided and tailored amongst breathtaking scenery in the French Alps and the Rhone Alps Region of France. This proven Practice Bicycle formula of the ideal balance between quality rides, race viewing and relaxing is enjoyed by all our discerning bike riders and non-cycling guests. Can’t get enough of cycling in the French Alps? 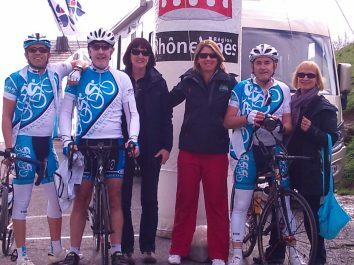 We also offer our classic Lake Annecy bike trips before and after the Critérium du Dauphiné. Why not extend your holiday and turn it into the cycling trip of a lifetime? Tour Type Ride your bike and watch the best bike races in the world, together with the professional that live it! Our bike race tours combine the very best cycling with bike race viewing and relaxing. Experience the bike races like you have never before! Activity Level Because our tours are always based at a single location, we can tailor the daily ride routes to meet your riding requirements and abilities. Available Packages All our prices are Australian $ per person based on twin share accommodation. If you are an individual guest, a single room surcharge will apply. If you have already arranged accommodation, you can select our 'Rides Only' package. 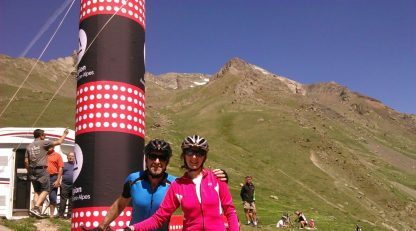 For avid fans of international cycle races who don’t wish to ride, or for non-cyclists who want to accompany their bike riding husband/wife/partner at the extraordinary French Alps experience in June this year. 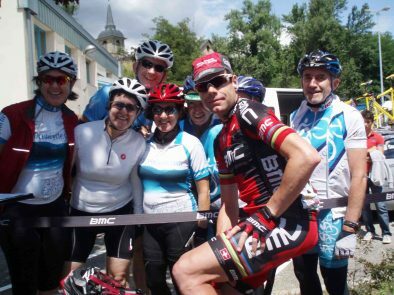 In fact, enjoy all the same benefits as the Critérium du Dauphiné Bike Race Tour guests! Only your choice is to join in the race action and experience all the uniqueness of the marvellous French Alps in June at a more leisurely pace from the comfort of the support vehicle all with your local team in Annecy! My wife and I have just finished our Criterium du Dauphine Bike Tour with Bridget and Paul. It was a wonderful trip for both of us, myself as a rider and my wife as a non-rider. 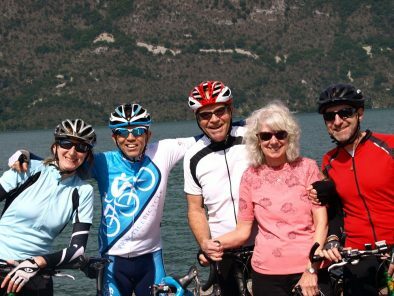 Both Paul and Bridget are world class cyclists and hosts that share their knowledge of riding and special local knowledge of the area surrounding Annecy. They prepare the daily rides taking into account the wide ranging skill levels of the riders involved. The groups are typically two to eight guests which makes for individual attention. The rides are fantastic, the country scenery and roads couldn’t be better. We’ve travelled a great deal in our lives and were still surprised by the beauty of the area. Paul was our riding guide, coach and tour guide on the daily trips. His interest in making it both fun and challenging makes for a great ride. He knows the riders skill levels and everyone will be challenged without going beyond their physical abilities. We couldn’t have asked for a greater, premium experience in what has to be the greatest cycling area in the world. Add to that the chance to see the pros riding the Criterium at the finest viewing spots made for a winning combination and we feel very lucky to have been with Bridget and Paul. We look forward to riding and touring with them again in the near future. New roads and new climbs for this years Dauphine. Don’t miss out in 2019 and register above. Today is arrival day with your private transfer from Geneva International Airport (Switzerland) to your hotel in the wonderful town of Annecy nestled at the base of the French Alps and on the shores of spectacular Lake Annecy. Once checked-in, relax and take the time to enjoy one of the most stunning towns in the world, explore the medieval streets and the canals of the ‘Venice of the Alps’. Un-wind from your travels, take a leisurely drink and become apart of France for just a few days. 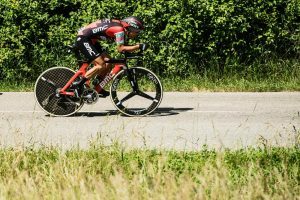 Should time permit enjoy a welcome ride around spectacular Lake Annecy the ideal preparation for the following 4 fantastic action packed stages at the Criterium du Dauphine 2019. This evening we invite you to join us for a Welcome Aperitif and Gastronomique Dinner at one of Annecy’s finest Restaurants to experience local Haute Savoie cuisine! Today is our first live action of the Criterium Dauphine 2019 and we will be witness to a unique event, with new routes and climbs on offer in a format that will surprise the best professionals in the world on the roads of the Rhone-Alps this June. We will pick-up the action as the fast men of the peloton arrive on the streets of Voiron and their final opportunity for a stage victory prior to the final 3 difficult stages in the mountains. Enjoy our ride of lakes as we leave Lac Annecy to Lac du Bourget and through the Chartreuse Park to all the finish line action in Voiron. These superb roads are here for you to experience with fresh legs as much or as little as you wish with your Professional Team in the French Alps. With every cycling effort there has to be an equal reward and what could be better than a hearty restaurant lunch to enjoy together before the race peloton arrives at maximum speed. Voiron is one of the three gateway towns of the Regional Natural Park of Chartreuse and the famous Liquor of the same name. Since the 18th century, the Carthusian monks have been distilling Chartreuse, a totally natural liqueur made from 130 plants using a closely-guarded secret recipe. A visit to the world’s largest cellar at the Caves de la Chartreuse is highly recommended. 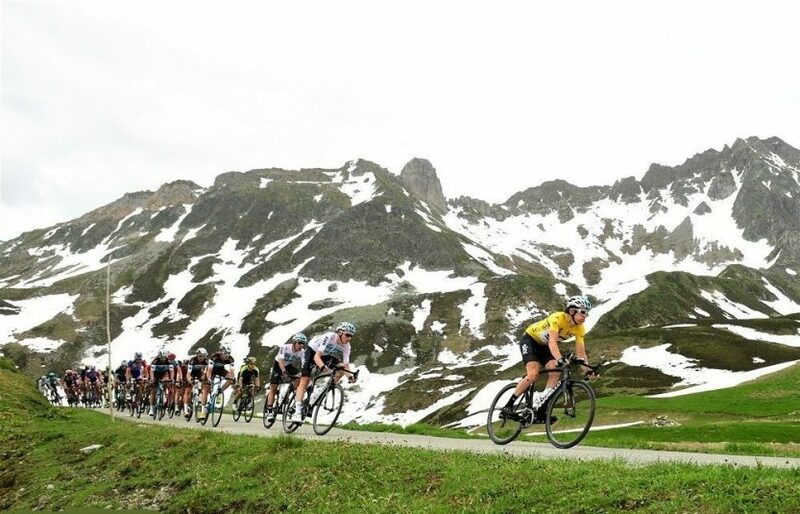 ‘Off the beaten track’ is the theme that the race organisation has given to this years Dauphine route, today the race hots up with the first of 3 Alpine stages to decide the winner of the Criterium Dauphine 2019. These roads are not particularly high by altitude; add the speed of the very best professional climbers in the world and the big challenge begins! These fantastic cycling roads are amongst some of Practice Bicycles favourites and we enjoy them as much today as we did in the very beginning back in 1997. We can’t wait to share them with you and they become your favourite cycling roads also. Take advantage of your team’s planning and all their local knowledge to give you the best of both worlds with your own superb ride for a fabulous day of cycling and all the action as the Dauphine peloton in full flight on one of their 8 Cols of the day. It’s time to relax and refuel with your hidden gem restaurant lunch and enjoy the rest of this special day and a memorable moment of cycling at this year’s Criterium du Dauphine! Return to Annecy by vehicle or take advantage of the euphoria of ‘Cycling Paradise’ with breathtaking views cycling all the way back to Annecy! The Tour de France last visited this ski resort in the Massif de Belledonne back in 1980 this is exciting racing terrain that will make for a spectacular final week-end at the Dauphine in 2019. 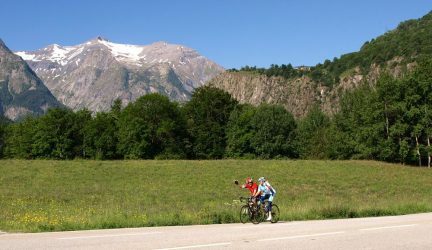 Heading into the Alps with your own magnificent rides and supported all the way by the local professional guides at Practicebicycle does not have to be so daunting with your own choice of ride options, tailored to your requirements as you pedal on the route of these famous cycling roads. 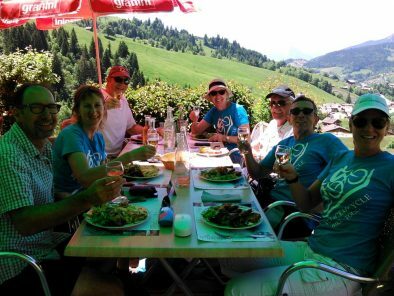 With our own work done for the day and at your ‘Unique Live Viewing Spot’ in the Alps your team has thought of everything for you, get your breath back and enjoy your Alpine restaurant lunch and all the action of the finish line of stage 7 at the Criterium Dauphine 2019. Today is our last superb ride opportunity together during your Dauphine bike tour and after yesterday’s Alpine stage, we have one final adventure as we head deep into the Grand Alps…it has to be experienced to be believed, if you still have your uphill pedalling legs! We’ve seen all the sights of this years Criterium Dauphine from the superfast sprinters to the amazing climbers in the mountains, this morning enjoy the opportunity of a close up look at the weary warriors of the road at the final stage start. 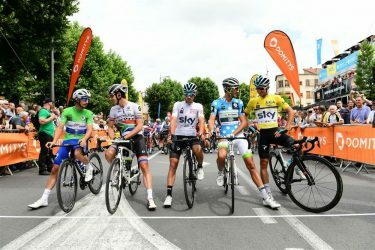 After 1200km of racing on new and testing roads the peloton has one final day of suffering, take a look at the teams as they prepare for their last effort to decide who will win the prestigious leaders jerseys at the 2019 Criterium Dauphine. 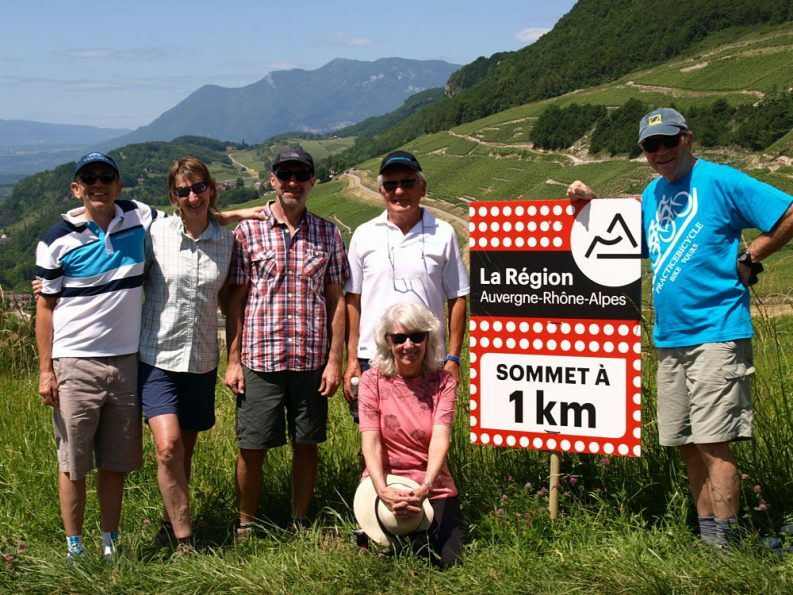 Flexibility with our premium small group allows for the very best ride options on our local roads of the Aravis Mountain range; with options for all abilities pick your perfect ride to end an incredible cycling holiday in the magnificent French Alps. 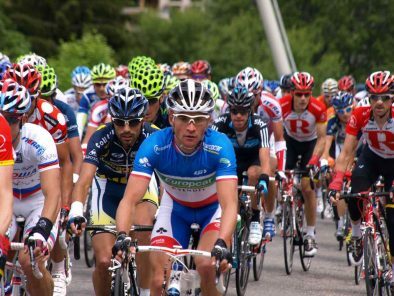 Celebrate the Dauphine bike race tour and all your amazing ride accomplishments one last time over a restaurant lunch with Practice Bicycle Tours. Today is the departure day from your Criterium Dauphine adventure. Your team will say good bye this morning and transfer you to Geneva International Airport (Switzerland) for your midday departure. Practice Bicycle Tours wish you a “Bon Voyage”, safe cycling until we Practicebicycle together again. 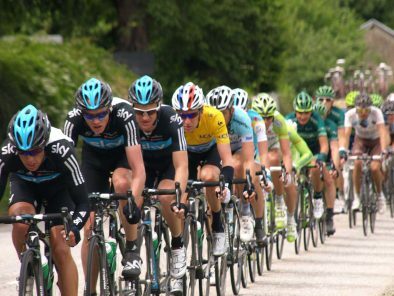 Whether you have years of cycling experience or are just new to the bike the Criterium du Dauphine bike race tour is for anyone who is a fan of the best bike racing in the world! With our local knowledge from over 20 years riding this amazing cycling destination, expect only the very best rides. Each cycling route during your Dauphine Bike Tour will be tailored specifically to your bike riding ability and experience, including the opportunity of riding on parts of the stage route. So you can have a challenging ride or a comfortable ride – the choice is yours with the professionals! Our Bike Race Tours are packed full of race action and the very best cycling of your life. Should you still have energy to spare then Annecy is one of the best places in the world to explore! the stunning location of Lake Annecy is the absolute perfect base for your Criterium du Dauphine cycling holiday. Practice Bicycle choose proven 3* quality, air-conditioned hotel accommodation located in the heart of undoubtedly the most beautiful town in France, Annecy. The Perfect location to enjoy the best of the Criterium du Dauphine bike race in 2019. We enjoy a challenge as much as we love cycling. The team at Practice Bicycle has a history in professional bike racing and coaching, with your host Bridget Evans racing professionally on the roads of France (1998 -2008) so if it’s a challenge you are looking for, we can definitely find just the right rides for you. After all, the area around Lake Annecy is home to over 20 classic Tour de France cols! If you are looking for a specific challenge or to improve your cycling, then consider one of our winter and summer training camps. Whats included in the Weekend Package? If your short on time escape for the weekend with our Friday & Saturday Night Package (14 – 16 June). 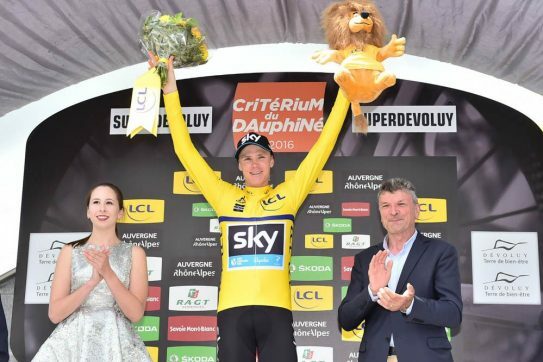 The Criterium Dauphine Weekend includes; Airport Pick-up & Drop-off, 2 Nights Hotel accommodation + Breakfast, 2 Stages of the Criterium Dauphine & Restaurant Lunches (15th & 16th June). Let the professionals take care of all the details. 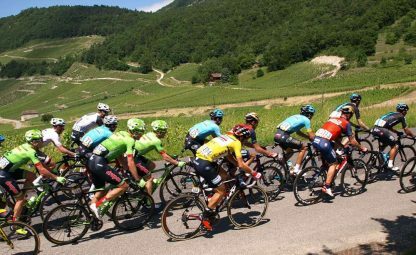 Fully escorted and supported to the best live viewing spots to catch the Dauphine stage race action including a superb restaurant lunch each day. Ride some of the most mythical cycling routes around Lake Annecy and the French Alps all at the Criterium Dauphine! On each of our tours we tailor the daily rides to the riders experience offering a choice of distance each day, including riding parts of the Criterium du Dauphine race route. Take a look at the exciting itinerary above! In addition Practice Bicycle has developed 100+ routes from Annecy for riders of all levels, only possible with over 20 years cycling in the Rhone-Alps of France. To get an idea of what sort of rides you will be doing in ‘Cycling Paradise’, have a look at a sample of our rides in Annecy. 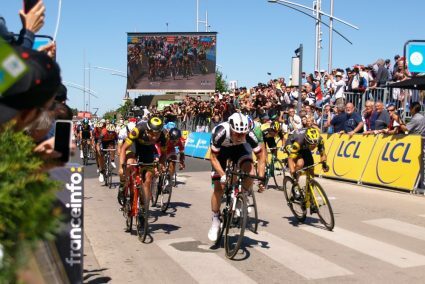 As our Criterium Dauphine Non Cycling guest and bike race fan you experience all the spectacle, excitement and action up close and personal of the very best bike racing in the world! 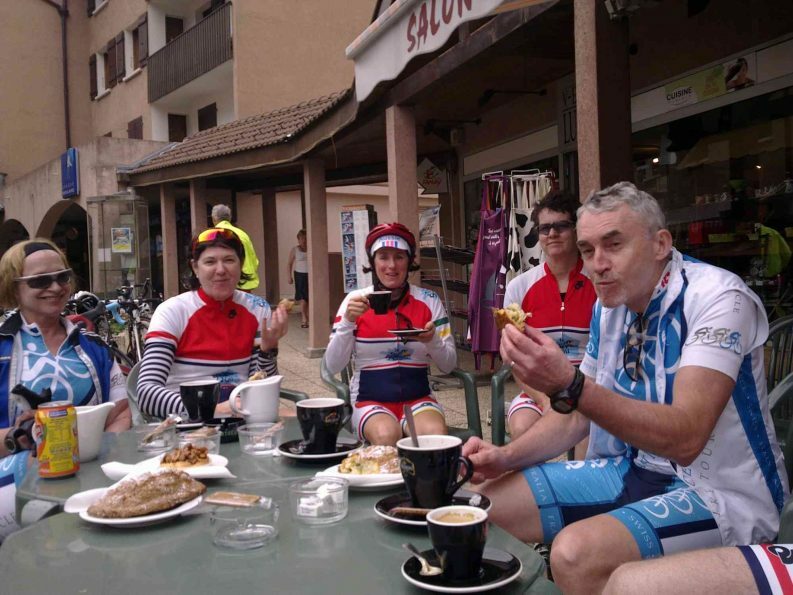 In addition our local support team will share with you culture and villages on route whilst catching up with the cycling group at our ‘Unique live viewing spots’ and handpicked restaurant lunch together. An amazing June vacation at the Criterium Dauphine in the Rhone Alps of France. Why do you choose to watch 4 stages at the Criterium du Dauphine bike race tour? 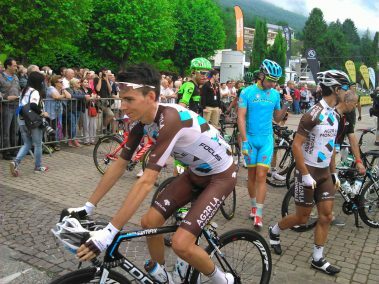 Our specialty bike race tours are focused on showing you the very best race action with your own great riding experience, including viewing the Criterium du Dauphine professional race on a selection of intriguing and spectacular stages. Maximising your cycling vacation time and enjoyment with viewing the race action live, contrasting with your own variety of personally tailored guided rides and the opportunity of enough time to relax and experience your idyllic Lake Annecy in the French Alps location. 4 unique ‘live viewing spots’ of the decisive Alpine stages of the Criterium Dauphine that only a local would know! Breathtaking ambiance of the high pastures of the Massif des Aravis Mountain Range, the tranquil roads of Massif des Bauges park & peaks of Massif de Belledonne Alps. Out of this world cycling deserves the very best variety of flavours of gourmet French restaurants in the Rhone-Alps. 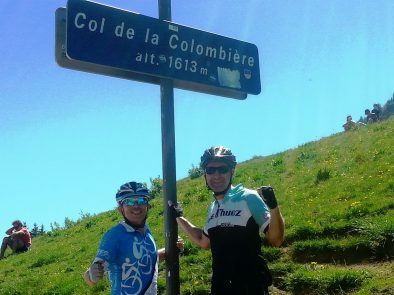 Ride amazing Valleys, Lakes & Cols all on offer, Col du Frene (969m), Montee De Pipay (1561m), Col de la Colombiere (1618m). Great cafe stops during the tour at unique French Alps towns and villages; Aix-les-Bains, Albertville, Alby-sur-Cheran & Thones.